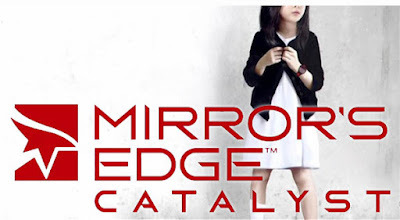 when the Dice-developed EA-published game MIRROR'S EDGE made its debut in 2008 (at the peak of the EGFC or Engineered Global Financial Crisis) Free Planet revelled in the stark-utopian backdrop to some quite innovative gameplay hopes and wishes. Ultimately, it was a flawed first prototype masking as a corporate product that needed a few more iterations down the development pipeline to be truly finished. Taking example maybe from a Shigeru Miyamoto-era Nintendo's brutally long-term development cycle where only the core elements from an initial full gameplay prototype are finessed into a final product, the Stockholm-based DICE have been hard at work for the last SEVEN YEARS and the eye-tattood central character Faith is back. Dice have really pulled all the disparate threads of game-mechanic narrative-gameplay together. A pre-ghost that shows you the moves. A series of footsteps on the relevant part of the world where you need to be. The improvements in the skeletal model. The rain. The skins. The world. Oh my gaming gods, I knew this was gonna be a great improvement on the original... and like a good corporate asset, I misled you'all slightly. It's the first thirty minutes of gameplay, not twelve. Enjoy.